Home When agony followed ecstasy! S. SKANDAKUMAR, a former Secretary of the Board of Control for Cricket in Sri Lanka and skipper of the Tamil Union Cricket Club recounts their key game against Bloomfield and how Tamil Union won it and ultimately lost it on re-scrutiny. The need for financial sponsorship resulted in the prestigious P Sara Trophy giving way to the Lakspray Trophy tournament in the season 1982/83. As winners of the former Trophy in its inaugural year in 1950, the Tamil Union team was understandably enthusiastic about repeating that achievement in the first year of the Lakspray Trophy Tournament as well, for the club. The final round matches were of three days duration and were played on a League basis amongst eight qualifying teams, commencing January 1983. The points system applicable to the final round to the best of my recollection, was as follows: Eight points for a first innings win and 12 points for an outright win. In addition the following bonus points also applied: 0.1 bonus point for every 20 runs scored; 0.1 wickets bonus point for every wicket taken. Further there were additional bonus points awarded for the following achievements: (a) A total score of 300 (applicable to the 1st inning only) -1.0 batting bonus point; (b) Bowling the opponents out for less than 150 runs (applicable to the 1st inning only) - 1.0 bowling bonus points. In an effort to discourage slow over rates, there was also a penalty system that applied to each over under bowled on a stipulated minimum average of 16 overs per hour in a completed inning. For this purpose the total duration of an innings was divided by the total number of overs bowled to ascertain the shortfall, if any. The Board’s Hony Recorder then was that very amiable and evergreen Archibald Perera (since called to rest by the Almighty) who released the table of points officially at the conclusion of each weekend’s matches. According to that table, at the end of the penultimate weekend of the final round, Bloomfield, who had completed their engagements by then, had a clear lead of 17.675 points over their nearest rival, the Tamil Union, who were to play the Police at the Park on the final weekend. The sports journalists, in their Friday columns on the morning of the match, were unanimous that our task was a truly formidable one, as we had to achieve the following targets to dislodge Bloomfield at the top. We batted first and at lunch were a dismal 82 for 5 wickets! Understandably there were many anxious faces in the dressing room during the break, but a strong comeback by the lower order saw us through to 300 by stumps. On the 2nd day, Police held out for 221 which meant that we had forfeited the all important bonus point for bowling a side out for less than 150 in the 1st innings. Our strategy had therefore to be reassessed and necessitated our having to bat a second time to score a minimum of 200 to compensate for the bowling bonus point of 1.0 that we had forfeited in consequence. We declared our second innings in the morning session of the 3rd day at 250 for 9 wickets, hoping to give ourselves sufficient time to bowl Police out to secure the much needed outright win. They put up a great fight with stiff resistance coming from Nimal Senasinghe, Jayantha Paranathala, and G.S Ratnayake in particular, all of whom had a good season that year. However assisted by some brilliant fielding and hostile bowling, we came into tea with Police 7 wickets down. On checking the scorebook on a hunch at the tea break, I realized that we were in serious danger of incurring penalty points for not maintaining the overall average of 16 overs to the hour. (the pacemen had operated for a major part of that innings). That penalty would then have swung the fine balance back to Bloomfield even if we had won outright! So, when play resumed after tea, much to the confusion of the large crowd witnessing the game, Anura Samarasekera the left-arm spinner and I, wheeled down a rapid 10 overs between us in less than 30 minutes, to ensure that our over rate average was raised to 16 to the hour. We changed quickly between overs and bowled an outside the off stump line. As the batsmen were battling to save the game, they were content to let these harmless deliveries pass. It was clearly understood by the team that NO catches would be taken in this period, even if offered, nor any appeal made for a possible wicket, as we needed the batsman to stay on till we restored our average over rate per hour to 16. Once that was achieved we went back on the offensive, and in the next few overs, some remarkable pieces of fielding sealed the fate of the game, much to the delight of the players and a large number of supporters. In fact, by the time we reached the dressing room, two bottles of champagne had already been delivered with the courtesy of a genial and popular ex- Josephian philanthropist! The celebrations that followed that night at the club went well into the morning hours. The following day’s headlines summed it all up….DAILY NEWS - Tamil Union’s finest hour; achieve near impossible; DAILY MIRROR - Tamils kings of cricket; SUN - Tamil Union’s mathematical magic; ISLAND - Tamils do the incredible. A week later, in view of the narrowness of the margin of victory, officials of Bloomfield decided to call for a re-scrutiny of the score books. When this was done, it was found that in the very first match of the Premier League Tournament, between Tamil Union and Colts played in January, at the Oval, there had been a scoring error whereby we had not been penalized as we should have been, for a breach of the minimum number of overs that had to be bowled per hour. Marginal though the penalty was, it nevertheless had a decisive effect on the eventual outcome of the tournament. In addition to my role as captain of the Tamil Union, I was then the Asst Secretary of the Board of Control for Cricket in Sri Lanka and also the Chairman of the Tournament Committee, to whom quite rightly, Bloomfield’s appeal was addressed. To avoid any conflict of interest, I requested the other members of the tournament committee comprising Ranjit Samarasekera, M.F.A. Khaffar, Vernon Caldera and S.E.G. Perera to look into the matter independently and advise me of their findings. The position as claimed was confirmed, and on the recalculations, Bloomfield went ahead of the Tamil Union by 0.15 of a point! The tournament committee thereafter forwarded a note to the Board, signed by us all explaining that on a re-scrutiny of the score sheets Bloomfield retained their position at the top of the table by a margin of 0.15 of a point and were therefore the rightful winners of the Lakspray trophy in its inaugural year! It wasn’t an easy pill for the team to swallow considering all the planning that went into the whole tournament and particularly the final match. The margin of 0.15 points in effect represented 30 runs in bonus points and the thought did cross our minds that it may well have been bridged, had we known earlier! It was a very young team that I was privileged to lead that year, and they learnt a crucial lesson through that experience viz ‘it is not always that you get what you feel you deserve, in life’. The disappointment did not prevent us from congratulating Bloomfield on their success. In the final analysis, the noble game, as always, reigned supreme. 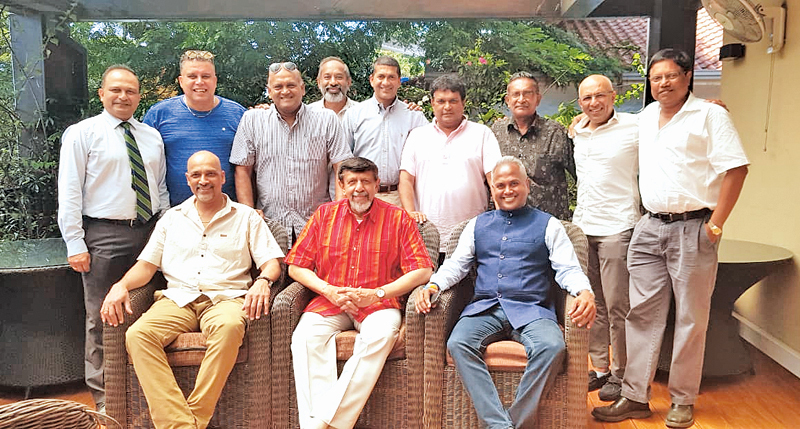 S Skandakumar (Royal, captain), Indrajith Coomaraswamy (Royal and Harrow vice captain), Lakshman Aloysius, Dushan Soza, Ashley de Silva, Wayne Jansz and Nirmalal Perera (all St. Joseph’s), Upul Sumathipala, AJ Samarasekera and Athula Samarasekera (all Mahinda), Walter Fernando (St. Peter’s), S. Shivaraj (Isipathana), Channe Wijemanne (D.S Senanayake), Sudath Munaweera (Prince of Wales), Shantha Jayasekera (S. Thomas’, Mt Lavinia), Upul Gunasena and Sujeeva Rajapakse (both Thurstan).